Click here if you need details to plan your trip to Englands historic York. Depending on the U.S. departure city, airlines serving Londons Heathrow Airport are American, British Airways, and United. Airlines serving Londons Gatwick Airport are American, British Airways, Continental, Delta, Northwest, and TWA. The 1-800 phone numbers and Web links for these airlines are available at this magazines Airline page. 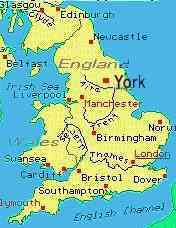 York is approximately 200 miles north of London via auto route A1. Visitors who venture outside of London are generally recommended to rent a car. Autos are available via Auto Europe, Avis, Europe By Car, and Hertz.. The 1-800 phone numbers and Web links for these agencies are available at this magazines Auto page. Train service to York is available from Londons Kings Cross Station. You will find the best value by staying in an establishment within a short walking distance of Yorks outer walls. For example, a comfortable B&B, Craig-Y-Don, is within 4 blocks of the gate, serves a good breakfast, and is run by the Oliver family at 3 Grosvenor Terrace, Bootham, York, Phone: (09094) 637186. A variety of lodging accommodations and eating establishing for York are described in detail in Rick Steves' Great Britain. Another good source for travel information on York and other areas in Great Britain is Fodor's Great Britain. These and other books on Great Britain and Europe are available via the amazon.com link below. The Web site links below also provide information on lodging and eating. York is approximately midway between London and Edinburgh, at the confluence of the Ouse and Foss rivers.. The friendly city of 100,000 has one of Englands most varied histories, dating from Roman through Norse, and Norman ages. The walled old-town area measures approximately one square mile, is easily accessible on foot (closed to autos), and is filled with sites, museums, churches, shops, and restaurants.Major sites include the Minster (cathedral), Cliffords Tower, Jorvik Viking Museum, and the Castle Museum. The York Ghost Walks have become world reknown since their inception in the 1970s. York University Info: this site is maintained by the local university and includes history and sites.